The last two weeks have been something of a dream for DCU Soccer Assistant Manager and St Patrick’s Athletic midfielder John Russell as he picked up his first ever League of Ireland winners’ medal and also got engaged. Russell, who is Declan Roche’s number two on the sidelines for the DCU Collingwood team, made the switch from Sligo Rovers to St Pat’s prior to the 2012 season. This season he has played an instrumental part in Pat’s title challenge, making 25 league appearances and scoring four goals along the way. He admits that the title win hasn’t quite sunk in yet. During his time with Sligo, Russell won consecutive FAI Cups in 2011 and 2012 but his first league title has been the pinnacle, he says. At the beginning of the season many pundits and fans were tipping the title race to be a two-horse race between Sligo Rovers and Shamrock Rovers. Indeed eight games into the campaign it looked like there was no stopping the Rovers from the west. Eight consecutive wins saw them flying high at the top of the table leading many people to believe that they would ease to the title. 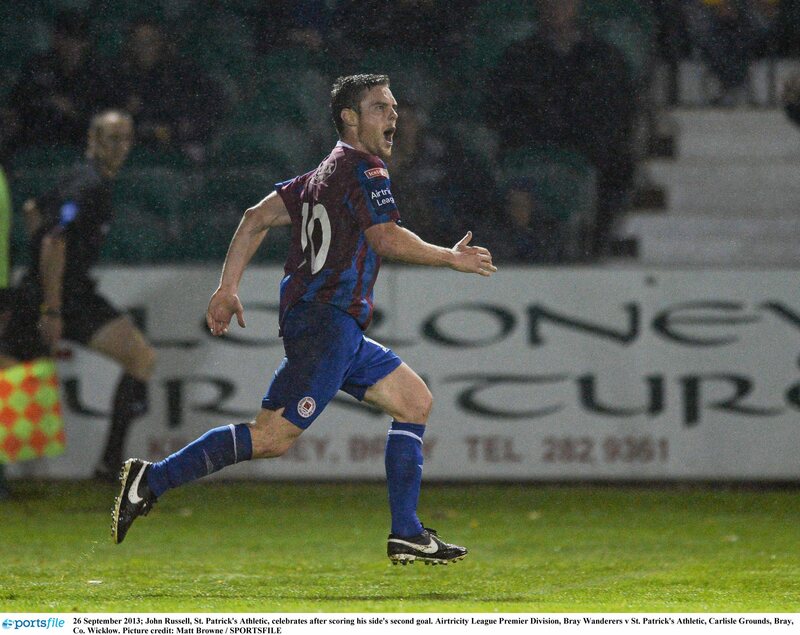 However it was Russell’s St Pat’s who put an end to their winning streak with a 2-0 victory in Richmond Park in April. Russell is adamant that the belief was always present in the Pat’s camp but that the form of Sligo was worrying. “The belief was definitely always there. At the start of the season we set out our goals and ambitions and the main one was to go and win the league. We knew with the group of players we had, some of them Liam [Buckley] had kept from last season and some other new lads that had been brought in, that we had a great chance. If the win over Sligo was a turning point early on in the season, the turning point towards the business end of the year came against Dundalk last month. Locked level at the top of the table the two sides went into this game knowing that a win would most likely see the victors go on to take the title. There was no doubt that the game was a title decider, says Russell. Russell was one of the players to suffer the heartbreak of a cup final defeat last November when St Pat’s lost out to Derry City in the Aviva Stadium. It’s now 53 years since the Inchicore side have won the cup but the Galway man believes that failures such as that last November can eventually turn out to be very beneficial to the team as a group. “Sometimes when the team comes together, especially when it’s a new group, you have to experience failures to drive you on. Hopefully now we can push on next year and retain the league and maybe get that FAI cup that Pat’s fans have been longing for now for years,” he says. Russell also paid tribute to the fans that have followed Pat’s up and down the country all year, citing their support as being a major factor in the team’s success. “The fans have been brilliant, it’s a really close knit club; St Pat’s. When we won it the last day all the fans ran onto the pitch and there were great scenes. They’ve been following us all over the place and even last year, when we got through the three games in Europe, the amount of fans that travelled abroad was phenomenal.